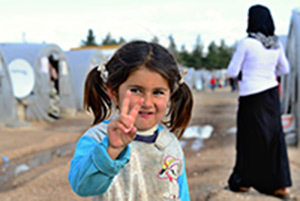 Western University, led by the Faculty of Social Science and in partnership with the London Cross Cultural Learner Centre, is raising funds for G5 Private Sponsorship Applications for Syrian refugee families. We are really thrilled to announce that the first Syrian refugee family that we are sponsoring has arrived in London. The family includes six children, all under the age of eight, and their mother. 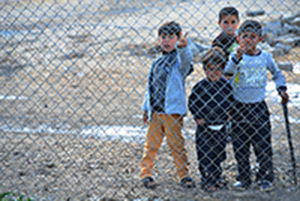 They spent seven months in Turkey after fleeing their home in Syria. They are all very happy to be in London, and are looking forward to a great future in Canada. Read more about their experiences settling in to the city in the Western News. We would like to thank all those who provided donations and the volunteers who worked so hard to make this happen. We would also like to acknowledge the high level of support that we have received from the Western community. In addition, we thank Mastermind Toys and IKEA Canada for their generous donations. Our latest news is that a second sponsorship application has now been submitted for a family of four, including mom, dad, and two children. We are optimistic that the family paperwork will be processed in a timely fashion and that they will be coming to London soon. 3) Disburse the amounts received to sponsored refugees upon their arrival according to their settlement plan. 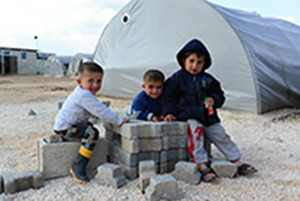 Donate online by clicking: www.canadahelps.org/dn/9556 and when asked to select the fund your donation will support, choose "Western Social Science Refugee Sponsorship" from the dropdown. The London Cross Cultural Learner Centre is also set up with Qtrade Securities to receive Share Donations. Once the transfer is completed, the shares will be sold immediately on the market and the net proceeds will be transferred to the Western Social Science Refugee Sponsorship Fund. If you are interested in this option, please contact Victoria Esses at vesses@uwo.ca and she will send you the necessary forms. There are profit tax breaks for share donations to non-profits.